We all know the brewing process, well at least the physical activities – lugging sacks of malt and spent grains, timing your mash, checking temperatures and swearing over slow running pumps. But what actually happens deep in the mix of grains and the furious boiling of wort? Why is 65°C so important in the mash tun and an hour’s boil essential when bitterness develops within 15 minutes? Like many seemingly simple processes which require skill, knowing just which points are essential matters as much as the overall theory. Boiling an egg or toasting bread have equally critical stages – its just that we learnt them long ago and no longer notice – until the phone rings and your breakfast is up in smoke. The brewing process is similar, just more complex and with a few more stages. Here’s how it goes under the surface – and, to start here’s the sequence of how the stages join together. Step one is to extract the sugars from malt. 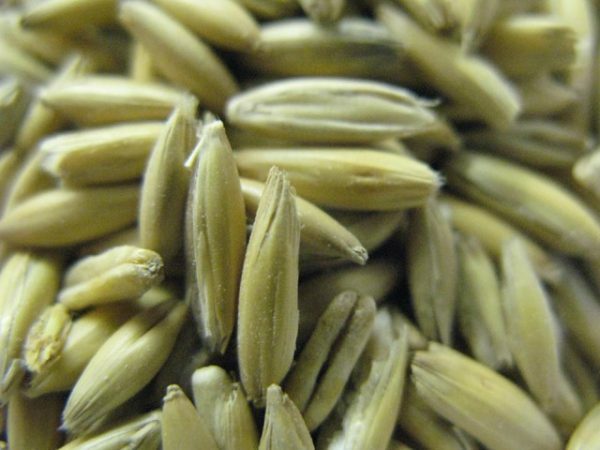 Malt is the dried kernels of germinated barley. The barley grains are harvested from the field, soaked in water and left to germinate until the internal enzymes have been synthesised. Normally these enzymes would digest all the starch to simple sugars and allow the grain to grow into an independent plant. For brewing this is a poor result so the grains are dried at just the right time with most starch intact and the enzymes developed. Mashing is conducted in an open vessel or mash tun where the malt is incubated with brewing liquor between 60 and 70oC (140-158°F). Such a temperature is important in order to optimise the enzyme activity to digest the starch. Too low a temperature and the rate of reaction is too slow, too high a temperature and the enzymes are rapidly denatured and the mash stops. Of these sugars glucose, maltose and maltotriose are fermentable. The dextrin sugars are four glucose molecules or longer and cannot enter the yeast cells. As a result they are not converted into alcohol and carbon dioxide but instead provide important characteristics of beer, particularly the mouthfeel and body. As we can see more dextrin and less maltose are produced at higher temperatures. This is due to differences in enzyme action and results in different beer character. Keeping a close eye on your mash temperature from brew to brew is essential for consistency in your beer. Once the sugars have been produced in the mash tun it is essential to drain them off in the wort ready for boiling in the copper. This requires a development of a mash bed above the mash plates of the mash tun. A carefully developed mash bed will filter small particles from the wort so leaving behind unwanted proteins, polyphenols and husk remains. All features which would compromise your beer. Proteins are particularly important to control as they can remain in the wort to precipitate during storage of the beer. Some proteins will be digested if the mash is conducted at low temperatures as may be done for lager beers. 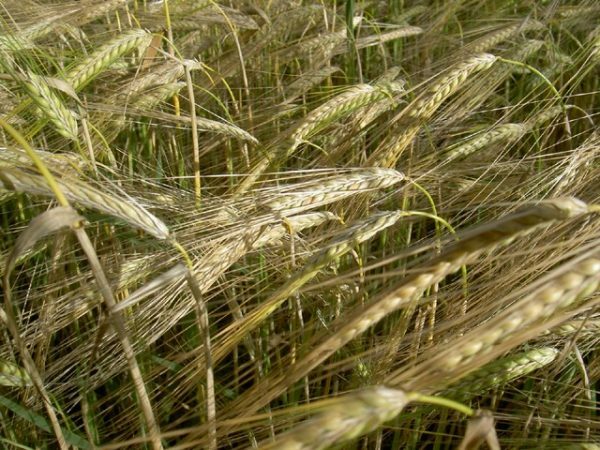 In ale brewing most protein digestion occurs during malting. Once the mash is complete fresh liquor is sparged onto the mash while the wort is being collected. This sparging rinses residual sugars from the mash. Measuring the specific gravity of your wort as it runs from the mash tun allows you to judge how well your mash bed has performed. A well developed bed will show a slow decline in gravity initially followed by a smooth fall. A disturbed bed will show a rapid fall from the first runnings. 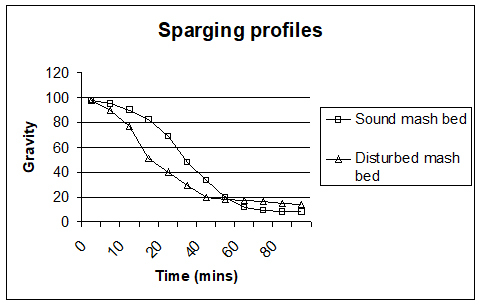 Greater losses will occur from a disturbed bed as less of the grain will be rinsed by the sparging. Once collected in the copper the wort is boiled with hops to extract flavour, particularly bitterness and aroma compounds. Boiling also stabilises the wort by killing any residual microorganisms from the malt and by precipitating proteins. In fact proteins are very important to remove to minimise the chance of a hazy beer later. Just the right amount of protein should remain in the beer to help the head foam but not too much to precipitate or encourage microorganisms to grow. Hops are available in many varieties with different aroma characteristics. Classic hops include Goldings, Fuggles, Saaz and Hallertau and provide specific flavours. More recent varieties such as Cascade, Northdown, Cluster and Mount Hood often have more bitterness potential and more novel flavours. Boiling typically requires 60 minutes to precipitate enough proteins and balance the hop flavours. Bitterness is the most distinctive flavour developed during boiling and depends on the isomerisation of  acids. The conversion of these to iso  acids is rapid but incomplete because of the pH effects on the reaction. Only 25 to 30% of the potential bitterness is actually developed or found in the final beer. The other hop flavour character developed during boiling is the complex hop aroma which arises from hop oils. These are released from the lupulin glands and will evaporate with the steam produced. Some oils evaporate more rapidly than others depending on their boiling point. As a result the hop aroma varies during the boil. At the end of boiling the wort should be rapidly cooled and transferred to a fermenter where yeast will be pitched. Cooling is important to conduct rapidly and away from air to minimise oxidation. Oxygen is, however, needed at this stage to support yeast growth and may be added directly to cooled wort. As long as yeast is added immediately the wort should not spoil. Fermentation is the process whereby yeast cells obtain energy. It is a specific metabolic process which does not require oxygen and produces ethanol and carbon dioxide as by products. The amount of ethanol produced will depend on the amount of sugar present and a useful formula to determine the alcohol level – by volume – is to multiply the drop in gravity by 0.129. For example a beer which began at an original gravity of 1048 and finished at 1008 would have 40 * 0.129 = 5.16% abv. Measuring specific gravity through the fermentation will produce a profile resembling that for the mash run off. In this profile the gravity will decline over a period of a few days to a finishing point of around 25% of the starting gravity. This profile is useful if you wish to keep a track of your yeast performance. For example a profile which starts slow and finishes with a high final gravity (attenuation point) indicates a poor yeast (curve A). A profile which starts rapidly, falls smoothly and finishes at a low point (say 20-25% of the initial gravity) is desirable (curve B). As yeast ages and conducts more and more fermentations its fermentation power can decline resulting in slower fermentations and a higher final attenuation. An assessment of yeast viability, such as by using methylene blue dye, will indicate the condition and health of the yeast initially and through the fermentation. 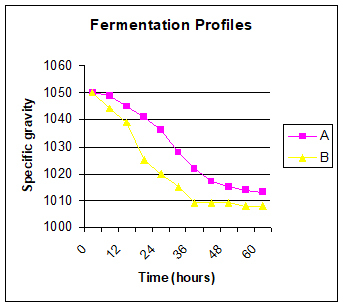 Comparing profiles for sequential brews can indicate the condition of your yeast and suggest when a replacement is needed. Comparing viability profiles for different yeast strains can indicate how they are affected by the conditions of fermentation. Flocculation of yeast is an important feature for the final clarity of the beer. The higher the flocculation index of the yeast the more rapidly it will settle at the end of fermentation and the sooner the beer will be clear and ready to package. Counts of yeast in the beer will show how the yeast is settling and will indicate how yeast strains differ. High yeast counts should correlate with low flocculation indexes. As fermentation proceeds flavours change and beer becomes increasingly fruity as ester flavours are formed. Hop aroma may persist and the balance between hop, fruit, alcohol and other flavours is an important character of the beer. A final flavour feature is carbonation produced by dissolved carbon dioxide. This prickles the tongue and is refreshing, particularly in light, hoppy beers. Moderate levels of around 2 grams per litre are characteristic of cask ales while levels of 4 to 5 grams per litre may be found in keg and small pack beers. Careful storage of the beer after fermentation is important to balance all of these flavours and to clarify beer of suspended yeast and other solids. Once matured beer is packaged into casks, kegs or small pack (bottles and cans). Cask ale is dispensed from casks containing live yeast and requires a period of time to settle in the cellar. It is served from a hand pump on the bar. Keg beer is filtered in the brewery and partly carbonated to allow dispense under pressure. Bottled beer is often filtered but some versions may contain yeast to allow conditioning during maturation in the bottle. Whichever way it is packaged your beer should reflect the different stages of production – malt and residual body from the mashing, hops and bitterness from the boil and fruit and other flavours from fermentation. A good brew is one which has a suitable balance of character for its style, an absence of faults and a good presentation of colour, foam and appearance. Given all these your best option is to sit back and enjoy your labours. From a one-day taster session to a nine-week intensive residential course. Whatever your brewing aspirations, Brewlab training is internationally recognised as one of the best ways to acquire the skills and knowledge you need.